When a simple handshake “bet” between friends on Sunday’s game becomes an overpowering, heart-racing compulsion, you might want to check yourself. Whether it’s a roll of the dice, flip of a card, a big game or a number in a race, too often the pleasure of a possible big payoff costs more than your hard-earned cash. It’s no great surprise that gambling is popular among millions of Americans. Vegas was built on “donations.” As much as $5 billion is spent on gambling in the United States every year. With every bet, gambling releases dopamine in the brain, the same neurotransmitter triggered from drug or alcohol use. 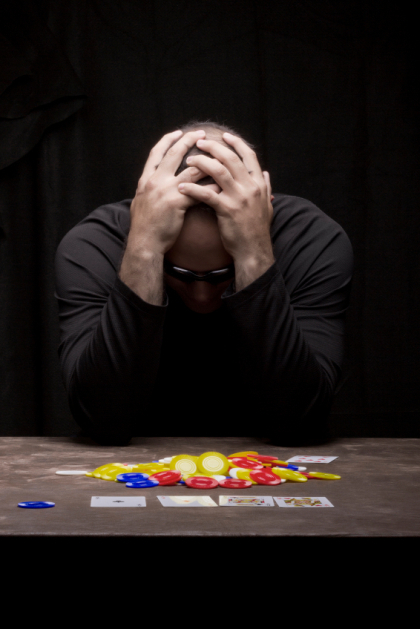 Gambling addicts all too often experience financial ruin, accruing tens to hundreds of thousands of dollars in debt. The cycle spirals downward quickly as many addicts turn to crime to payback debts and afford the next rush. The destruction leads to despair and eventually gambling addicts have a high rate of attempted or successful suicide. Gambling’s effects on the family are also sobering. Families of people with compulsive gambling are more likely to experience domestic violence and child abuse. Children of problem gamblers are at significantly higher risk of suffering from depression, behavior problems, and substance abuse. Gamblers might like to learn that God offers a “bet” of His own, and it’s the ultimate gamble. In Psalm 52:6, the word “bet” is synonymous with the word “trust” which puts a new spin on gambling. However, the God gamble doesn’t come with a low, moderate or high risk choice. It’s all or nothing. Trust God for Everything — Trusting in something or someone, other than God, to meet your needs takes more faith than faith in God. Because that means you are willing to trust something else instead of the Creator of the universe, author of life and the savior of your soul which was paid for through the sacrifice of His own son’s life. However, believing in God and His son, results in forgiveness of your sin, a relationship with the Almighty who calls you “friend,” eternal life in the Kingdom of God and a rich and rewarding life on earth. Trusting in money, and gambling as a means to provide meaning, joy, excitement, fulfillment is a recipe for disaster. Instead, trust God to meet those needs, and reserve your thrills for the Kingdom not cash.